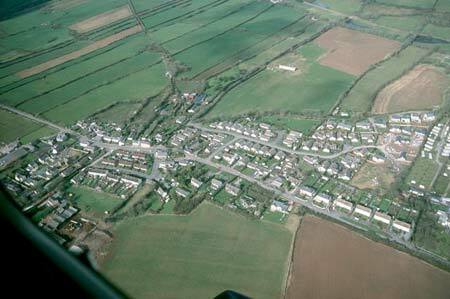 A small area of modern Pembrokeshire, comprising the built-up village of Jameston. During the medieval period, it lay within the Anglo-Norman manor of Manorbier (and Penally) which was a mesne lordship or honorial barony held, by the service of 5 knights, of the Lordship and Earldom of Pembroke, a heavily Anglicised region that was brought under Anglo-Norman control before 1100, re-organised along English manorial lines and never retaken by the Welsh. The barony had been held, since the very early 12th century, by the de Barris and, on their extinction in 1392, was sold to the Dukes of Exeter before reverting to the crown in 1461. From that point onwards it was leased to a succession of individuals before being settled on the Philippses of Picton Castle, with whom it remained until the 20th century. A number of authors have attempted to define and to date Jameston’s topography. Roberts suggested that it was a pre-Norman settlement within a later, Anglo-Norman field system. However, as noted by other authors, the surrounding field system is likely to have prehistoric origins (probably bronze age), based on the prehistoric ‘ridgeway’ (see Manorbier Newton strip fields character area), and the village appears to overlie this field system. Kissock has argued that the village has a radial plan, suggesting pre-Norman origins. However, his ‘radial’ plan-elements do not convince; moreover, Kissock himself acknowledged that the settlement formerly lay around a formal, rectangular village green (now infilled). An Anglo-Norman foundation is more probable. Jameston has little recorded medieval history. A chapel is marked in the village on Saxton’s map of 1578, presumably a chapel-of-ease of Manorbier parish, but its date is unknown. It may have been a late foundation. The place-name, recorded as ‘apud Sanctu Jacob’ in 1295, and again as ‘Saint Jameston’ in 1331, may be derived from a fair rather than from the chapel - the late 16th century source George Owen recorded that an annual fair dedicated to St James was held in the village. Jameston then appears to have been established as a manorial vill, exploiting the good-quality arable land of the locality. 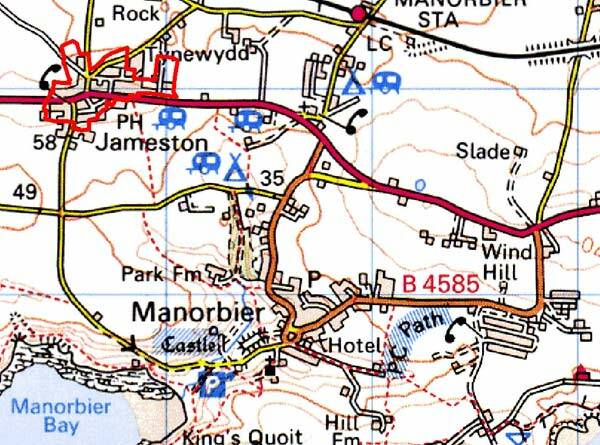 It was recorded in some detail in three later surveys of the Manor of Manorbier, in 1601, 1609 and 1618. It represented one of the three divisions of the manor, with a reeve responsible for rent-collection, and from the late 17th century was the scene of the manorial courts. It was the second largest vill in the manor, and had seven substantial farms, ten houses and one cottage. Corn-production in the village hinterland is confirmed by the surveys, but the loss of 22 acres of arable is recorded between 1609 and 1618. It is clear from the mention of ‘four closes’ in the surveys that the process of enclosure of the surrounding field strips had already begun by the early 17th century. Tenants held land by freehold, and by two forms of copyhold called ‘husbandry hold’ and ‘censory hold’, which appear to be relics of an earlier, feudal tenure. At Jameston, 5 freehold tenants rendered either cash or customary red roses. Over the three surveys, 22 husbandry tenants are recorded possessing substantial farmsteads - a total of 8 barns, 10 haggards (corn hay barns) and 7 cowhouses is recorded. The seven censory holdings seem to have had the poorest land and only one barn, and 2 cowhouses are recorded. It would appear therefore that Jameston village is little larger now than it was in the 17th century. Indeed, it may have contracted; there is no field evidence for this, but the tithe map of c. 1840 shows a nucleated settlement rather smaller than at present. By 1840 the village green had been already infilled. Most of the present village buildings are of 18th- and 19th-century date, and include the church, which was not established until the 19th century. A nonconformist chapel was built in 1820 while, during the 18th century, a Quaker Meeting house and burial ground were established. 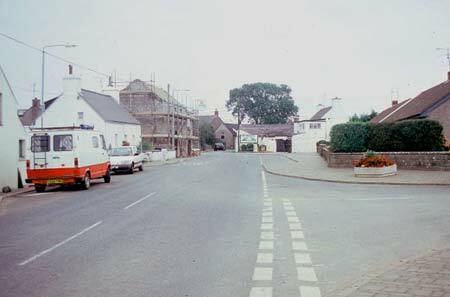 Jameston still has one working farm, and a public house, but is now overwhelmingly residential in character, with two rows of 20th century housing. The annual fair has been revived. Jameston is a small historic landscape character area comprising a village situated on level ground at about 60m above sea level, and lying at the junction of the east – west A4139 road and several minor roads. It consists of a small nucleation of 18th and 19th century buildings and modern dwellings. It was an agricultural village, but now there is only one substantial working farm, with large ranges of modern agricultural buildings, located on the southern fringe of the village. High stonewalls surrounding the two-storey 19th century Swan Lake Inn constrict the main road in the centre of the village. Here there is a cluster of local limestone-built, slate roofed mainly mid-to-late 19th century dwellings. There are one- and two –storey examples, with most in the vernacular tradition, although window size and symmetry indicate leanings towards the polite ‘Georgian’ tradition. Small ranges of stone-built agricultural buildings of an old farm in the centre of the village have been partly converted to non-agricultural use. The Mission Hall, a small church in debased gothic style is also situated in the village core. Two substantial old farms of considerable architectural sophistication lie on the village fringe. The substantial stone-built ranges of outbuildings set informally around the courtyard of both farms have been converted to residential use. The houses are both originally 18th century. One is three storey, firmly in the Georgian tradition with a stucco front elevation, and the other is a much altered late 18th century neo-gothic house. Modern houses, in small estates and individual dwellings, in a variety of styles and materials are interspersed with the older buildings, and maintain the tight nucleation of the village. A small caravan park is located at the east end of the village. Jameston historic landscape character area contrasts with the surrounding landscape of fields and farms.